Our music folders are used by choirs, bands, orchestras and other professionals and are high-quality, elegant and help you organise your sheet music. 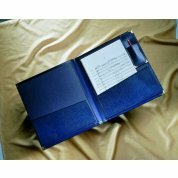 Our range of music folders come in a variety of colours and sizes, suitable as choral folders, orchestra folders and other sheet music folders. Perfect to give a sense of identity to your music group. Please note that our red and blue folders are now a slightly darker shade than they used to be. Please contact the sales team on 0800 072 7799 to see a sample. Our music folders feature full leatherette covers, so they are hard-wearing and will look handsome for years. They are hand-stitched – we don’t use glue on pockets and spines, so pocket seams won’t readily separate. All of our folders have brass-bound corners to enhance durability and protect your sheet music. Our choir and orchestra folders come in three colours: Concert Black, Royal Blue or Cardinal Red. A choice of styles and sizes is available for orchestral or choral use. Strings or expanding pockets for choral music; pencil pockets and windows for bands and orchestras. 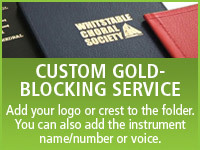 Black Cat Music offers a gold-blocking service on all of our choral and orchestral folders, so you can add your logo or school crest to the front of the folder. We can also add gold-blocked lettering, and many customers choose to gold-block the instrument name or number in the corner of the music folder. For more information about any of our music folders and related products, please Contact Us or give us a call on 01892 619719. A standard size (305mm x 356mm) orchestral folder with two bottom expanding pockets and one pencil pocket. Custom gold-blocking available to order.